Posted on October 30, 2015 at 12:00 pm. The re-installed Talos No. 2 by James Lee Hansen, with RACC's William Rihel. WHEN: Friday, October 30, 2015. Public art staff will be on site until 12:15pm. Talos No. 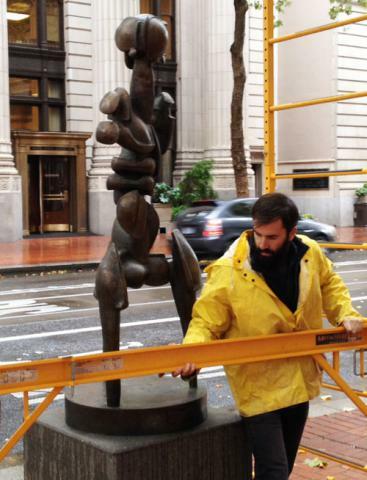 2, a sculpture by artist James Lee Hansen that was violently knocked down by a vandal in July, is returning today to its pedestal at the corner of SW 6th & Stark. Talos No. 2 has been absent from its pedestal since July 8. Working with art local conservator Robert Krueger and expert welders from Art & Design Works, the Regional Arts & Culture Council (RACC) coordinated a complete repair of the seven foot tall bronze that has overlooked the Transit Mall since 1977. 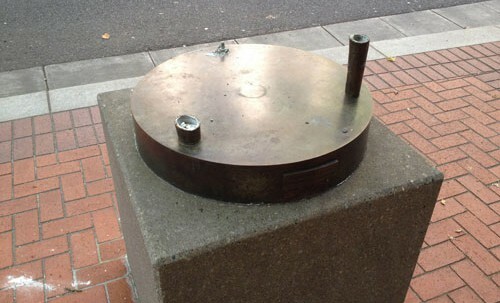 The three month restoration process began with the precise physical reconnection of the five pieces the 400 pound sculpture broke into when it hit the sidewalk. Once positioned, the adjacent edges were ground to expose clean metal, welded, and then delicately “chased” to create a joint surface with texture indistinguishable from adjacent areas. The repaired areas were then treated chemically to match the overall bronze patina. The City of Portland’s Fine Arts Insurance policy paid for a portion of the repair, and several donors have made small gifts to help cover the $2,500 deductible. Additional donations can be made at www.racc.org/donate. For more information contact Public Art Collections Manager Keith Lachowicz at 503-823-5404 orklachowicz@racc.org or visit http://racc.org/public-art/search.